During my reads on Saturday, I came across a post that directed me to another blog, titled Your Child Talking. This blog is written by a Speech/Language Pathologist, which I wasn't aware of at first. I started to write a comment, but it turned out to be fairly long, so I thought I would just make my own post! As a Public School Speech/Language Pathologist, it is very disheartening to have to tell a parent that their child's language isn't severe enough to warrant therapy, especially if that child is having difficulty in the classroom and the parents are searching for answers. But, we have to abide by the state guidelines. Private speech clinics/centers do not have to abide by the state guidelines, so that would be an option for the concerned parent. The post addressed a child who was hesitant to speak out in class because he was having difficulty saying some sounds. There are certain ages that a child is expected to say certain sounds. 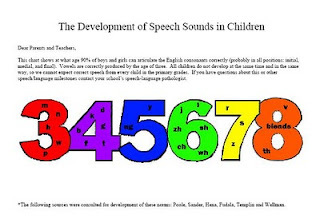 For example, /p,b,m/ are the first sounds that are expected to be made, and 'th' is the last (at around age 9). That being said, if a child is refusing to talk in class, that is a huge red flag. We have to look at whether or not the speech/language deficit adversely affects his/her educational progress. "Educational" does not just mean "academic"; it also includes "social, emotional, and vocational" aspects. So, that child would be considered for eligibility for certification as speech impaired, regardless of whether or not the sounds are "developmental" at that time. Generally, I try to wait as long as possible to refer a child for an evaluation, especially when it comes to saying their sounds. Many times a child will correct a sound on his/her own without therapy. And, with language, I am very hesitant to evaluate a child in Kindergarten during the first half of the year. The reason for that is that Kindergarten is very language based, and, many students have never been in any kind of structured program, so I have to give them that exposure before I even think about certifying them. Call me crazy, but I have a problem with certifying students when they really aren't speech or language impaired. Most states (I thought all of them had this, but maybe they don't) have some kind of "Birth to 3" program. This program is an early intervention program to identify children who may need speech/language services, or some other kind of therapy/help. The school system is responsible for children ages 3-21. If you have a child under the age of 3, and you're concerned about his/her speech & language skills, contact the health department or your pediatrician. They should be able to steer you in the right direction for your local Birth to Three organization. If your child is already 3 or older, contact your school system and ask them what the process is to have your child's speech and language screened. If your child is already attending school, contact the Speech/Language Pathologist at your child's school. Even if your child is homeschooled or in a private school, the public school system is responsible for serving your child. Below is a chart indicating when each sound should be mastered. The only thing that I would modify is that the 'sh', 'ch', and 'zh' sounds should be on the 7...but that's just my opinion! You may have to click on the picture to get a better look at the sounds. Great post! Thank you. My grandson was recommended to be evaluated in preschool and so far, his parents haven't done it. I wish they would because I also know that early intervention, when needed, can pre-empt problems as well. This is awesome, Mary!! Do you mind if I share this on my blog? I think it's very useful for parents. I wish I had this when I was a newer mom. I just decided to go back for my masters in Speech...right around the time you started following my blog...which is a weird "God" sort of coincidence. Pray for me...I'm gearing up to take the GRE in the Fall...to gain entrance, to begin leveling my BA, etc.! This is SO interesting! I'm excited! Awesome summary and explanation! It's clear, yet detailed enough. I enjoyed reading this post, Mary with the information you shared. I would think if a child refused to talk in case, that would definitely be a "red flag" for some type of intervention. I remember when my daughter was young, the doctors were pushing for her to get into speech therapy because they didn't think she was talking soon enough but I resisted it, she was just a "late bloomer" and had no problem expressing herself and had a wonderful vocabulary, etc. On the other hand, son had some learning disabilities that just fell a little too short to get "labeled" to get help through the school district so to catch him up we enrolled him in Sylvan for a bit and he got back on the road. I think each child is different and has different needs, yet sometimes they get all lumped together, know what I mean? Mary, thank you for this! I have saved this one to my fave's for future questioning and referencing.